BioWeekSF will soon be here again — January 5-10, 2019 — the week of the J.P. Morgan Healthcare Conference and 20 other events and forums. In preparation, the week’s premium online guide, BioWeekSF.com, is showcasing a series of reports, special features and more. Today’s feature is a Q&A with Sara Radcliffe, President & CEO, California Life Sciences Association (CLSA), co-author of the newly released 2019 California Life Sciences Industry Report. 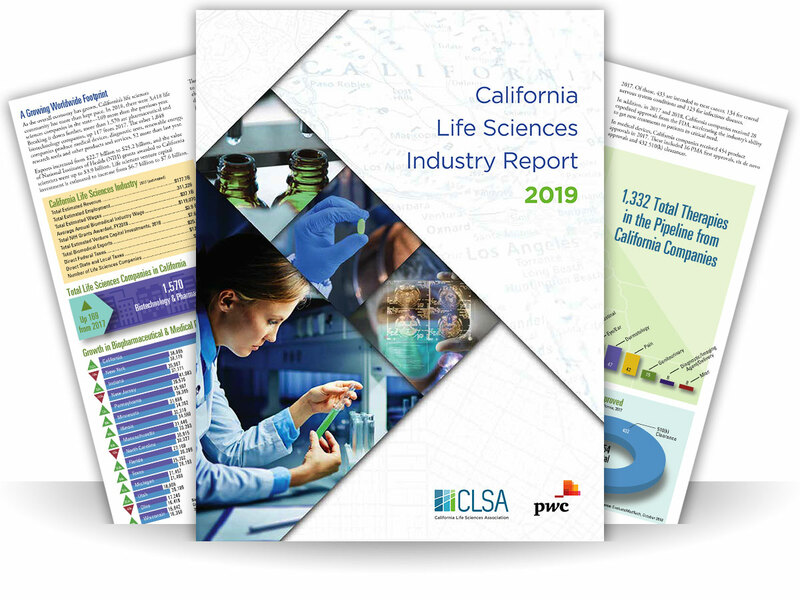 According to the new 2019 California Life Sciences Industry Report, the life sciences industry continues to be a strong economic driver in California, with all major indicators pointing to upward trends. Despite the high cost of locating in California in terms of real estate and housing of employees, what are some of the factors that are contributing to this growth, such as the regulatory environment in the United States and California, the density of major academic research hubs, etc.? California’s life sciences sector growth – marked by increases in employment, wages and new medicines – continues to exceed that of other regions around the nation due to our ecosystem approach. The industry retains its strength because it is constantly examining and evolving each piece of the ecosystem: education, infrastructure, corporate governance, investment, government regulation and other factors. We have built an engine that combines the strength of innovative companies that attract robust investment with universities and research centers that attract top scientific talent and National Institutes of Health (NIH) funding. That engine is humming right now, with the sector directly employing more than 300,000 Californians. When indirect and induced employment is added — jobs that support and are supported by the sector—the total is 958,000 people employed by the industry in California. In 2018, California led the nation by obtaining $49.7 billion in VC investments, more than half of the nation’s total. California continues to outpace all states with $3.9 billion in NIH funding, 15 percent of total NIH grant funding. In 2018, California labs were awarded 7,922 grants from the NIH, driving cutting-edge research. Our 2019 California Life Sciences Industry Report outlines these and many other measures of success. Life sciences is second only to computer technologies as far as the number of people actively employed by the sector. Do you see this trend continuing even as other states have begun promoting biotechnology? As the overall economy has grown, California’s life sciences community has more than kept pace. As Californians, we should all be thrilled that biopharmaceutical and medical device employment in the state has grown by 11.2 percent, adding 13,378 jobs. Employment in this same category fell in second ranked state New York. California’s ecosystem approach, along with its scale and infrastructure, are structured to sustain healthy growth for the foreseeable future. But, with success comes a responsibility to protect and nurture the sector through smart public policy. As the trade association representing the industry in California, CLSA is committed to working with state and national policymakers, industry leaders, patient groups and other stakeholders to improve public policies that accelerate the pace of innovation, create jobs, and, most importantly, help patients. With the midterm elections over, what are some of the issues CLSA will be following, advocating, and educating its members on in the year ahead that will keep California at the forefront of the industry? Public policy plays a critical role in supporting a healthy business climate as well as encouraging improved access to diagnostic and therapeutic technologies and affordable care for all Californians. As we look at the steady growth of the life sciences sector in California, we cannot lose sight of the factors that got us here. As a state, we must continue to grow our academic infrastructure. That means supporting higher education, research and K through 12 STEM programs. Taxation is always an important concern, and we should be on guard against proposals that could hinder biomedical innovation. This is critically important for both the health of our economy and the health of our nation. But perhaps the most important goal is to ensure that all patients have access to the medicines, devices and diagnostics that are being produced in our state and elsewhere. No one should ever be denied the care they need. As strong as California’s life sciences ecosystem has become, we must always be aware of the growing communities in Europe, China and other regions that are also embracing biological innovation. Many Californians have worked hard to get the industry to this level. We must continue that commitment to maintain our leadership position on the world stage and as the center of innovation. As the trade association representing the life sciences sector in California, we take this responsibility seriously, and we are committed to working with state and national policymakers, industry leaders, patient groups and other stakeholders to streamline regulations, increase education and research funding, improve the tax climate and deliver other policy changes that protects health innovation and patient access to care for years to come. California also leads in the development of innovative therapies. Does CLSA have a position on drug pricing and how it will impact innovation? Nothing about the life sciences is easy. Drug development is an arduous process that can take 20 years, sometimes longer, and cost north of $2 billion. It’s a long and difficult task, fraught with failure, but because of the work of our members and this sector, more than 1,300 new medicines, and even more devices and diagnostics, are in the pipeline. Many of these new therapies are intended to help patients facing cancer, infectious diseases, rare and genetic diseases and other conditions. For the life sciences sector to continue its amazing progress in delivering new medicines, it’s of paramount importance that we strike the right balance between rewarding companies for the cost of innovation and ensuring access to quality healthcare. So much of CLSA’s policy and advocacy work with officials locally, in Sacramento, and in Congress is aimed at maintaining that balance. We need to make sure there are no disconnects between the innovators who develop these therapies and the patients who need them. Affordable and timely access to medicines is every bit as important as the development process that makes them a reality. CLSA, and our partners in industry, government and academia, must continue this legacy, ensuring that all patients have access to the care they need, and that this valuable ecosystem continues to thrive in California. Finally, what do you see ahead for the life sciences industry over the next couple of years? As you read through our 2019 California Life Sciences Industry Report, you will see other statistics that validate the breadth and quality of our life sciences community. The state is well-poised to continue to grow and lead the nation in top universities and doctoral degree recipients, NIH grants, and life sciences VC investments – all necessary ingredients for sustained sector growth. However, a word of caution is always in order. Open up any company’s financial report and you will find these words: Past performance does not guarantee future results. The same is true on the state level. While California’s life science sector has done well, we face increasing competition from other states and nations. We cannot forget the sound ideas that got us here. But also, we must find new ways to grow the innovation economy and remain world leaders in the life sciences. That future will not get built on its own. The heavy lifting belongs to us. With sustained support, the industry’s companies, universities and research institutes will continue to provide new therapies to patients, and excellent jobs and other economic benefits to the people of California. As California continues to foster life sciences research, economic investment and job creation, CLSA will help propel it every step of the way. © Big3Bio, a division of BigBio Communications. All rights reserved.